Could Lucas Museum Land at McCormick Place? Gene Summers' McCormick Place Lakeside Center East Building, which has fallen into relative disuse, could be the site of the Lucas Cultural Arts Museum, says a noted architecture aficionado. CITY HALL — One of the city's top architecture aficionados says the best location for the proposed George Lucas museum couldn't be more obvious: the sprawling, classic, modernist, lakeside, but now largely overlooked McCormick Place East Building, just south of the site selected by a mayoral task force. "We've got a great building by a world-famous architect — Gene Summers of C.F. Murphy — the old McCormick Place, the oldest building on the McCormick Place complex," said Ward Miller, president of Preservation Chicago. "It's an amazing building that came out of the studios of Mies van der Rohe." Opened in 1971 to replace the original McCormick Place, which burned down in the '60s and which Miller called "just miserable, a big concrete box ... dubbed the 'mistake by the lake,'" the new McCormick Place offered immense, enclosed vistas and played host to the annual Auto Show and Boat Show. It also had a distinctive space-frame top, which served to bridge the Prairie School and the International Style, and which Miller said still gives it "that kind of 'Star Wars' stealth ceiling." 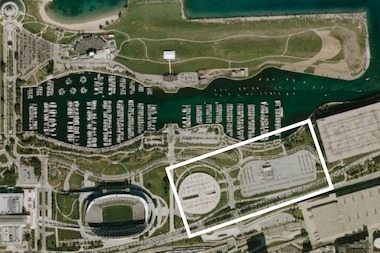 A bird's-eye view of the city-designated site for the proposed Lucas museum, boxed off between Soldier Field (l.) and the old McCormick Place (r.). The building, however, is no longer in vogue, and the greater part of the Boat and Auto shows and other McCormick Place events "have moved on to the other halls" built more recently, Miller said. "Really, for the most part, they're not at their full capacity." According to Miller, however, that minimalist look, combined with the original 522,000 square feet of space inside, would give the Lucas Cultural Arts Museum an immense blank slate to work with if it were placed there. "It would have the feeling of a new building if this were done correctly," he added, for instance by renovating the Arie Crown Theater and reopening the "slit" originally running crosswise through the building to allow lakefront access. "This could be a museum where all the funds go almost specifically into the displays, maintenance and staffing of the museum and collecting more, rather than spending hundreds of millions of dollars trying to build a new museum." The Lucas museum would hold the Star Wars' collection of art and movie-making memorabilia. Lucas, who is married to local businesswoman Mellody Hobson, is also being wooed by San Francisco, which is offering its own waterfront parcel. So how did Mayor Rahm Emanuel's hand-picked Site Selection Task Force overlook the vast resource that was right there in front of the city's lakefront face? It turns out spending hundreds of millions of dollars on a new building had a lot to do with it. One of the four key goals the task force set itself for the site was that it "would offer a setting for a new iconic structure," according to its final report, "one that captures the imagination of visitors and reflects the innovative genius of its benefactor." The report said "sites within existing historic landmarks or sites with active plans for development that would prevent new construction were removed from consideration." 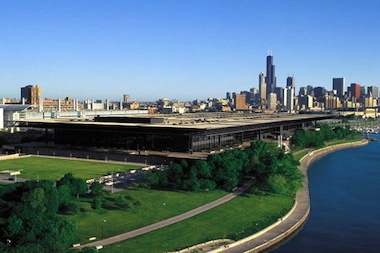 The Illinois Institute of Technology's Armour Building, the old Main Post Office spanning Congress Parkway, Festival Hall at Navy Pier, Block 37 and Wolf Point were all specifically ruled out. The old McCormick Place apparently wasn't even considered. That's because politicians love new buildings, because they keep developers, contractors and construction workers employed and happy. The report estimated a new museum building would create as much as 2,500 jobs and $200 million in construction wages, and have a ripple effect in up to $95 million in construction-related contracts for minority-owned businesses and up to $16 million for women-owned businesses. "We believe the proposal that we put forward is the strongest one for Chicago," said mayoral spokeswoman Libby Langsdorf. And, while Miller said the old McCormick Place basically plays host to "supplemental exhibitions" at this point, the city countered that it's still needed for the biggest conventions. Yet Miller was quick to point out converting the old McCormick Place would also remove a considerable city headache in that it would negate opposition from groups like Friends of the Parks, which argue that the new museum, if built on the parking lots south of Soldier Field, would violate Chicago's longtime Lakefront Protection Ordinance. "While we are very supportive of the Lucas Cultural Arts Museum coming to Chicago, we oppose its siting on lakefront public open space," said Friends of the Parks President Cassandra Francis in an earlier statement. "The Lakefront Protection Ordinance specifically states that 'in no instance will further private development be permitted east of Lake Shore Drive.' It is clear that the siting of the Lucas Museum in this lakefront location contradicts our prior city visionaries’ goal of continuous public open space along the lakefront." "I think this would be a no-brainer," Miller said. "It's a marvelous opportunity. It would offer so much to the lakefront, and extend the museum campus, without harming the footprint of Grant Park and without getting into the lawsuit of buildings in the park." It would also mean the city wouldn't have to relocate tailgating Bear fans. But of course it's all moot if Chicago isn't selected as site of the museum by Lucas himself, with his hometown of San Francisco also putting in a strong claim.